Lighter and smaller than Yak-9 but powered by the same engine, the Yak-3 was a very agile dogfighter and a forgiving, easy-to-handle aircraft loved by both rookie and veteran pilots. Early combat experience showed it to be superior to all Luftwaffe fighters at altitudes below 5,000 m (16,400 ft). It could roll with the Focke-Wulf Fw 190 and its turn rate was almost equal to the Bf 109. The biggest drawbacks of the aircraft were its short range, the tendency of the glued-on plywood covering the top of the wings to tear away under high-G loads, and poor engine reliability. The pneumatic system for actuating landing gear, flaps and brakes, typical for all Yakovlev fighters of the time, was problematic. Though less reliable than hydraulic or electrical alternatives, the pneumatic system was preferred due to significant weight savings. 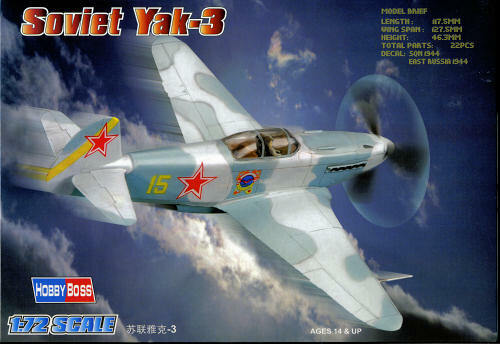 Since 1991, a number of Yak-3s have been newly manufactured by Yakovlev for the warbird market using the original plans and dies. These are powered by Allison V-1710 engines and have the designation Yak-3M. Several of these are airworthy today, mostly in the United States, but also in Germany and Australia. Others have been converted to "Yak-3U" status from Yak-11 trainers for private owners, with these aircraft also being popular worldwide. This is another of Hobby Boss' inexpensive kits for the beginners or those modelers who want a quick build and are not all the concerned about total prototype fidelity. I should say, however, that the newer the kit, the more accurate they tend to be. As you'd suspect, this one comes in a vacuformed tray with the parts securely held in place to prevent damage during shipment. It works well with small kits like this and also justifies a somewhat largish box for the plastic within. None of the other kits outside this range are so packaged. 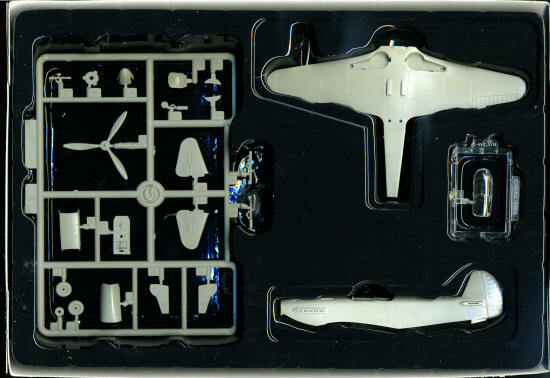 Anyway, there is one main sprue, one clear sprue (containing the one-piece canopy), with the other two slots containing the nearly complete fuselage and the other with the full wing and lower fuselage section. Preliminary fittings shows that this one will be a pretty quick build as the lower fuselage seam falls on a normal panel line. Well, normal enough for what is basically a plywood aircraft. There is an interior with a seatback and oversize control stick, the lower forward cowling is separate and the rest of the few parts have large tabs that fit into large slots. There are ejector pin marks on the inside of the main gear doors and the radiator bath, but most will just blow those off. This isn't really a contest class model. Not as molded and certainly not without even a hint of a main instrument panel. I do wish Hobby Boss would at least take the effort to include one as a decal. Instructions are colorful if nothing else. Most will not use them as there are so few parts as to make the 'what goes where' part of things somewhat inconsequential, but for the new folks, they will be appreciated for their clarity. Markings are for two aircraft one is obviously Normadie-Niemen with the blue/white/red spinner though listed as 'East Russia, 1944'. First I'd heard that these guys were over near Manchuria....... The other is '157 Squadron' and is the option shown on the box art. both are in AMT-11/12 upper and AMT-7 undersides. Gunze paint references are provided. Hobby Boss decals are quite good and these are no exception. I'm rather surprised that the yellow fin stripe on the box art option is not provided as a decal for there is plenty of room on the sheet for it. IOK, so one has to ask, is this one better than the currently available kits from Heller or Hasegawa. Well, probably not. Even the Heller kit has more detail and certainly this is true for the Hasegawa one. The Hobby Boss kit isn't made for those who want detail. That is clearly shown by the short cuts and slight diversions from the prototype in terms of shape that just about all of them show. in a nutshell, these are shelf kits, not contest kits. It is certainly on a par, dollar-wise with the Heller kit, and considerably less expansive than the Hasegawa variant. Hobby Boss kits are in a slightly different niche than the rest and they seem to filling that niche rather well as it seems all sorts of people are buying them. Thanks to me and my fondness for anything relatively cheap for this one.